CURWENSVILLE – In a tough week to get a game in, the Curwensville Area High School softball team was able to take the field on Friday. After yielding to a snow day, a soggy field and a rain-out, the Lady Tide faced Punxsutawney at Riverside Stadium for a non-league match-up. Curwensville struck early, but the Lady Chucks battled late to take home a 5-3 victory. It appeared that the eight-day lay-off was going to hurt Curwensville badly in the early innings as an error in the first inning led to a Punxsy run. 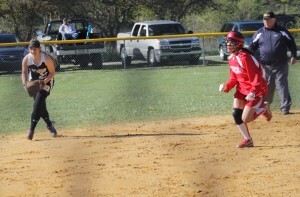 However, a double play in the inning ended further damage and allowed the hosts to get back in the game. The Tide knotted the score in the second inning as Cheyenne Pentz collected the team’s first hit of the day after one out. Abby Johnson set the table with a sacrifice bunt that she nearly legged out, and Megan Barrett cleaned up Pentz with a hard double to left-center. Curwensville took the lead in the third inning as freshman Nikki Harker recorded her first varsity hit – a double to the fence in center field. Taylor Goodman followed with a 1-and-1 pitch that she also drove to center field and cleared the fence for a two-run homer and a 3-1 advantage. Through those middle innings Lady Tide pitcher Tierra Shope and her defense were solid. The Lady Chucks managed just 13 batters in four innings, including the Tide’s second double play of the game. Shope finished the game by scattering 11 hits, striking out six, and walking only one batter. “Tierra pitched well the entire game,” Leigey said. “She walked just one batter and was ahead in the count most of the time. Unfortunately, they were able to take advantage of our few mistakes. The lone free pass from Curwensville came in the top of the sixth after a lead-off single. When Shope fielded a following bunt attempt, she whirled to get the runner at third, but the throw was just late, and the bases were loaded. The sophomore right-hander came back strong with two consecutive strike-outs. With two outs and the bases loaded, Punxsy pinch-hitter Ivy Philips singled in two runs to tie the score at 3-3. 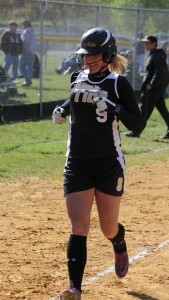 Lauren Wolfe also came through for the visitors with a pinch hit RBI for the lead. The Chucks added an insurance run in the seventh for the 5-3 final. Goodman’s homer and Barrett’s two hits including the double paced the host’s offense. Chelsea Engeholm, Janie Depp-Hutchinson and Sydney Phillips all hit safely twice for the Lady Chucks. Curwensville will travel to Sheffield on Monday in a rescheduled double-header that will start at 3:00. Two of the other games postponed earlier this week have been rescheduled. The Tide will now host Brockway on May 8 and travel to DuBois Central on May 15. The game with Keystone had not been reset as of press time. Chelsea Engeholm ss/lf 4120, Janie Depp-Hutchinson 3b 4120, Johnna Depp c 4110, Sydney Phillips cf 3122, Ashley Bacha 1b 4100, Mary Sloniger 2b 0000, Lauren Ball rf 2000, Ashley Walls ph 1000, Sarah London ph 1000, Tori Martin lf/1b 3010, Randa Depp p 2000, Ivy Philips ph 1012, Alex Magill 2b 2011, Lauren Wolfe ph 1010, TOTALS – 32 AB 5 R 11 H 5 RBI. Taylor Goodman 2b 4112, Madi Peterman cf 4010, Tiffany Carter c 4010, Molly Demchak 3b 3000, Cheyenne Pentz ss 3010, Abby Johnson lf 2000, Megan Barrett dp 3021, Hannah Bressler rf 3000, Nikki Harker 1b 3110, Tierra Shope p/flex 0000, TOTALS – 29 AB 3 R 7 H 3 RBI. ERRORS – Bacha, Sloniger; Peterman. LOB – Punxsutawney 5; Curwensville 6. 2B – Depp-Hutchinson, S. Phillips; Barrett, Harker. 3B – none. HR – Goodman. SAC – Johnson. SB – Engeholm. DP – Curwensville 2. PB – J. Depp; Carter. WP – R. Depp; Shope. HB – none. WP – R. Depp. LP -Shope (5-3).